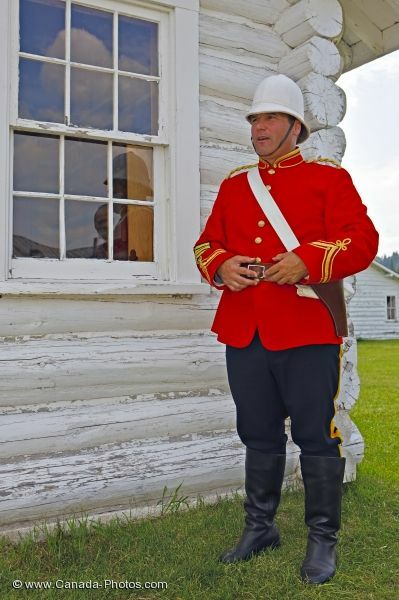 A costumed interpreter dressed in a period North West Mounted Police uniform stands guard outside the jail window at the Fort Walsh National Historic Site in Saskatchewan, Canada. The police patrolling the west at the Fort in 1875 would chase whiskey traders and horse thieves where they were watched daily while in jail. Fort Walsh was built to bring Canadian law and order to the region, stop the illegal whiskey trading business, put forth a great deal of influence by the Canadian authority at the border and to help build the implementation of Canadian Indian policy. For the eight years Fort Walsh was open, it made a huge impression in Canadian history and today visitors can re-live these years while touring the Fort Walsh National Historic Site in Saskatchewan, Canada. Picture of the jail house building and a guard at Fort Walsh in Saskatchewan, Canada.